The sun had not yet crested the distant hills as this canyon towhee serenaded me atop a saguaro, a lovely reward for getting out of bed so early on the weekend. It was the only picture I took that day but it was a lovely day on the trails nevertheless. This morning I deliberately slept in as I knew I would be too tired to feel safe driving if I got up at 4 a.m. so I chose a good night’s sleep instead. I see many of the same birds in our backyard as on the trails (we even had a couple of Harris’s hawks perching in the palm trees recently) but with the towhees it’s a bit different, a pair of Abert’s towhees are regular visitors to our feeders but I’ve never seen them in the desert, while canyon towhees have never graced our yard but I’ve seen them many places around the preserve. 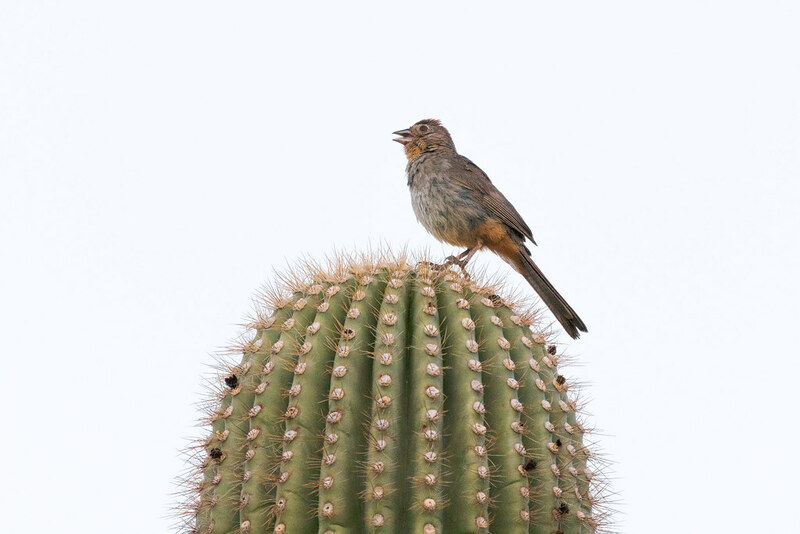 This entry was posted in Birds and tagged Arizona, Brown's Ranch, cactus, canyon towhee, desert, McDowell Sonoran Preserve, saguaro, Scottsdale, singing, Sonoran Desert, Upper Ranch Trail. Bookmark the permalink.